Bishop's panagia with corals and semi-precious aventurine stone. Material: silver 950, red coral, mother-of pearl, dark blue aventurine. 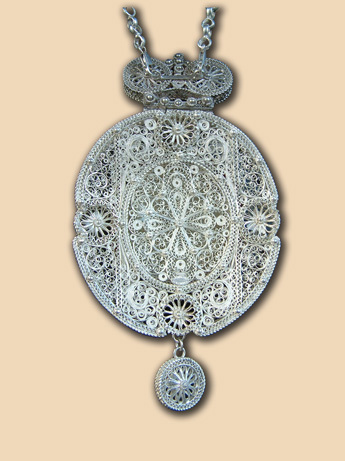 Size: panagia 9×17 cm, chain 140 cm. 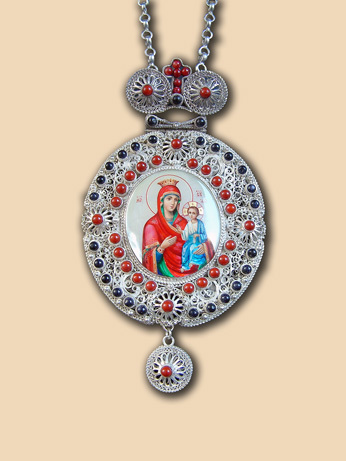 Weight: panagia 175 grams., chain 130 grams. Commissioned by: Mr. Vranic Djordje, Kraljevo. In possession of : His Grace John (Mladenovic), Bishop of Sumadia, Serbian Orthodox Church.